A graffiti portrait of the composer and pianist Alexander Skryabin appeared on this building in Moscow. Skryabin was the first composer in history to use a light organ. That's why the painting was done using lots of different colors. Russia switched to winter time. Russians are now sad that they'll no longer see sights like this any more on their way home from work since it gets dark at 6 pm now. 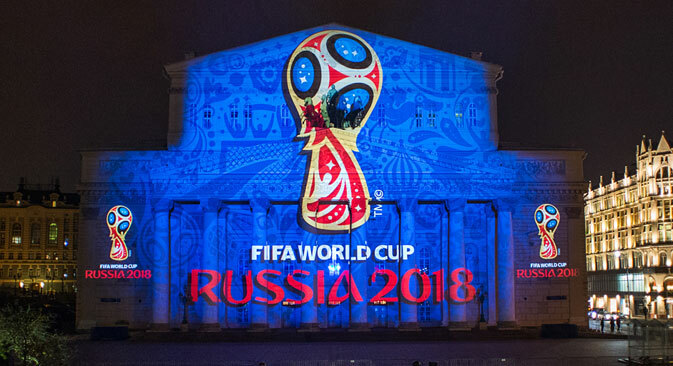 The presentation of the official emblem of the 2018 World Cup to be held in Russia was held recently. Many people criticized the emblem, calling it unoriginal and similar to the previous emblem from the World Cup in Brazil. Mikhail Khodorkovsky and Alexey Navalny have decided to give prizes to those who've suffered at the hands of the judicial system. 50 prizes of 100,000 rubles each will be given out in 2015 "for the fight against unfairness by those who've suffered". The ruble exchange rate continues to fall, while the dollar and euro grow stronger and stronger every day. The photo says, "Maybe we should rub his nose, too?" Halloween is especially popular among younger people in Russia. They put together costumes, go to theme parties at clubs, and throw parties themselves. You still don't know who you'll be for Halloween? We have some suggestions!